I just finished this flannel quilt top using Henry Glass Flannel Essentials 8 that I got in a kit at Mountain Creek. There were light and a dark version kits. I went with the dark version because it reminds me of my grandmothers crazy quilt. I believe they still have a few kits http://www.mountaincreekquilters.com/shop/Quilt-Kits/p/Flannel-Essentials--Male-Kit-x5346710.htm available on their website. The version I made is called the ‘male’ version because it is dark. Ritzy Thimble Quilt Guild hosted a class with Sue Jones teaching the Big EZ quilt. Here’s the different versions in various states of completeness from class. I love to see all the different fabric choices and what a big difference it makes in the look of the quilt. Found some pretty valentine themed ribbons at Hobby Lobby that I couldn’t resist. I decided on coordinating black and white ribbon instead of the traditional pink. Also found a red wired ribbon with buttons that I had to have because remember I love me some buttons. Mountain Creek is a quaint little shop in Greenback TN. It is about 40 minutes outside Knoxville and well worth the trip if you are ever in the East Tennessee area. They have lots of fabrics, wools, patterns, flannels, notions, fabric kits and more. One of the best things about Mountain Creek is that Terry the owner keeps lots of quilts and wall hangings on display for inspiration. Terry also keeps fabric kits for many of the quilt samples she has made. Lots of MODA!!! and at very reasonable prices. The fabric average is $8.99 yard and Terry has sales several times a year. Thanks to my group of friends 'Bags and Hags' for inspiring me to sew again. 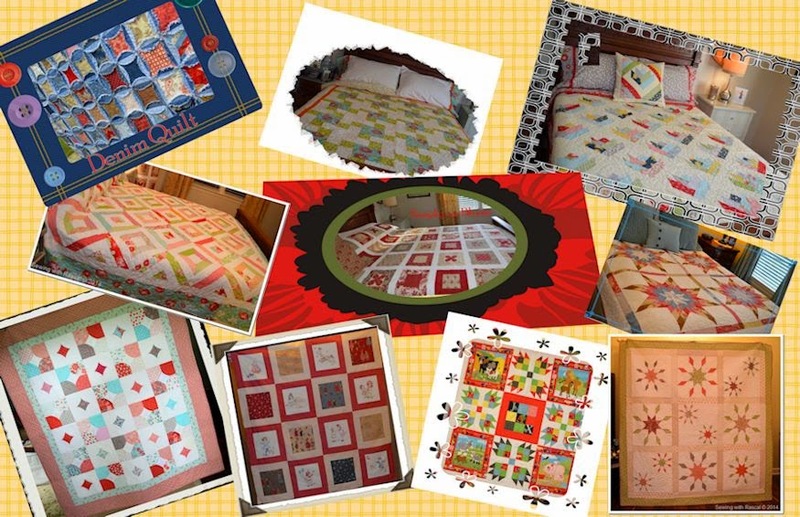 Here's a look back at some of the quilts I made in 2014. Some went to new homes and some stayed with me for now. You can click on the picture of a specific quilt to see it's blog post. I took a Mystery Quilt class at Pappy’s in Maryville TN ( http://www.pappysquilting.com/pages/about-us ) last year with Sue Jones as the teacher. Sue is my favorite quilting instructor. If you have never heard of a mystery quilt, it’s a fun way to make a quilt where the quilt pattern isn’t revealed until the end. Look at this darling baby quilt that Sandy Donoho made for her cousin Morgan’s first baby that’s due this month. The pattern is Play Ball! by the Pieceful Quilter and the fabric is mostly from Alexander Henry. Great job Sandy! She had the quilting done by Pat Pike of Pike’s Piece in Vonore Tennessee. Funny thing how quilters of a feather flock together. Sandra is a relative that I was just introduced to by ways of my blog. We share a love of quilting and crafting and I can’t wait to get out of the virtual world and meet her in person.